Northrop Grumman Technology Services Vice President and President Dr. Christopher T. Jones (Ph.D. '97), will be the guest speaker for the A. James Clark School of Engineering's Spring 2016 Commencement held Thursday, May 19 in the UMD Xfinity Center. 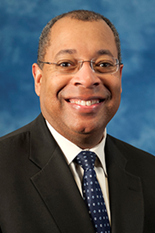 A UMD alumnus, Jones is corporate vice president and president of Northrop Grumman Technology Services, a recognized leader in integrated logistics; sustainment; modernization; defense, health, civil and government services; and training solutions as well as a member of the company’s Corporate Policy Council. Jones leads businesses for approximately 14,000 employees at more than 400 locations throughout the United States and in 16 countries, supporting a diverse customer base that includes the U.S. departments of Defense, Energy, Homeland Security, State and Interior; NASA; the U.S. Postal Service; and the Virginia Information Technologies Agency. Previously, Jones was corporate vice president and president of Northrop Grumman Technical Services, a sector integrated into Northrop Grumman Technology Services in January 2016. Jones also served as sector vice president and general manager of Northrop Grumman Technical Services’ integrated logistics and modernization division. He joined Northrop Grumman in 2004 as director of product support for the Airborne Early Warning Program. In addition to program execution, Jones provided technical leadership during aircraft design, development, production and fielding. Jones worked for Sikorsky Aircraft Corporation, where he led analysis, flight tests and research on innovative rotorcraft technologies. He also was the company’s technology lead on the RAH-66 Comanche helicopter program and served as chief systems engineer for the Naval Hawk program. Jones earned a bachelor’s degree in aerospace engineering from the Georgia Institute of Technology, two master’s degrees in aerospace engineering and engineering management from the University of Dayton, and completed his Ph.D. here at Maryland. Jones serves on the board of directors for the National Action Council for Minorities in Engineering and on the board of visitors for the Clark School of Engineering, the Georgia Tech Advisory Board and the Air Force Association Board. Most recently, Black Engineer magazine selected Jones as the 2016 Black Engineer of the Year Award (BEYA) by Black Engineer magazine, and the UMD Department of Aerospace Engineering inducted him into their Academy of Distinguished Alumni for his contributions in the field of aerospace engineering.